Whisked through the Scottish Highlands from the airport at Inverness, my husband Alan and I caught our first glimpse of the futuristic spires of the Kessock Bridge. Crossing the Beauly Firth, we were taken down quiet country lanes to our home for the next three weeks. We were shown to our room, beautifully decorated with crisp, white linen. We walked downstairs to the conservatory for a welcome drink and a breathtaking view stretched out before us. The pretty Scottish garden, the inky waters of the Cromarty Firth twinkling in the afternoon sun, the mountains above sprinkled with a light dusting of snow…we felt like we were in heaven. We lead two very different lifestyles. Most of the year we live in the vibrant city of Chiang Mai in Northern Thailand, but as the Northern Hemisphere warms up we head for Europe, happy in the knowledge that our accommodation along the way won’t cost us the earth…or anything at all. And it’s not just in Europe we enjoy free stays thanks to housesitting. As well as Hong Kong we’ve also secured free stays in Singapore and Manila. The U.K. is one of our favourite spots though we’ve stayed in some stunning houses there… a gorgeous Art Deco home in Bristol, an apartment overlooking the marina in Hartlepool, a charming fisherman’s cottage in the seaside resort of Worthing, even an apartment in central London… and all rent-free. Our favourite location of all is here in the Scottish Highlands. Set amid farm and woodland we have breathtaking views overlooking snow-capped Ben Wyvis mountain and the crystal-clear waters of the Cromarty Firth—it’s a magical setting. We spend our days roaming the fields and our nights snuggled up by the fire watching the sun set over the mountains. The Black Isle has many different landscapes, the golden glow of the rapeseed fields, dense natural woodland, lush green sheep meadows, outcrops of thick thorny gorse and the wild rocky shorelines of the Cromarty, Moray and Beauly Firths that frame the Black Isle peninsula. In the village of Cromarty, fisherman’s cottages line the rocky shores and you’ll find art galleries, an award-winning bakery, artisan cheese sellers and curio shops. We settled in by the fire at the Royal Hotel and enjoyed a lunch of deep fried Buckie Haddock for $27. The haddock was huge, well cooked and came with thick, hand-cut chips, all locally-sourced produce. With so much to do in the area, we’re spoiled for choice, but one of the highlights has been a cruise on Loch Ness. It was an overcast day when we made the 45-minute drive to Loch Ness, something that only added to the eerie mystique that is part of the Loch Ness legend. From the moment we boarded the Jacobite Rebel our guide had us laughing and almost weeping with his stories of local folklore and history. 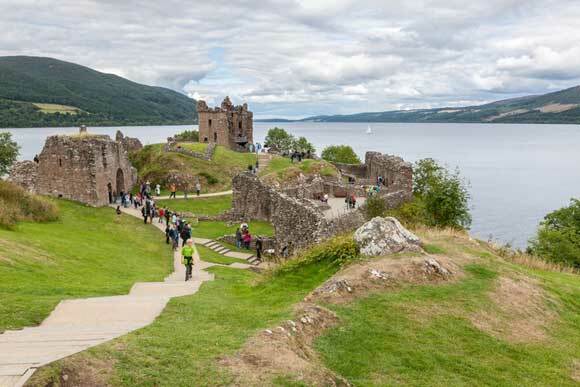 Nessie didn’t put in an appearance that day but no matter, we were left fascinated by the unanswered mysteries of this famous Loch and spellbound by the beauty of Urquhart Castle that sits on her shores. Discovering housesitting has opened up a whole new world of experiences for us. The savings we make allow us to stay in this part of the world for far longer than we ever could on a traditional holiday. We get to live like locals, see incredible places and make new friends everywhere we go. It really has changed our lives and we couldn’t be happier.